Angel City Derby Girls hosts the Shore Shots Round Robin May 31. Teams include Angel City, our ShEvil Dead, V Town Derby Dames, and San Fernando Valley Roller Derby. 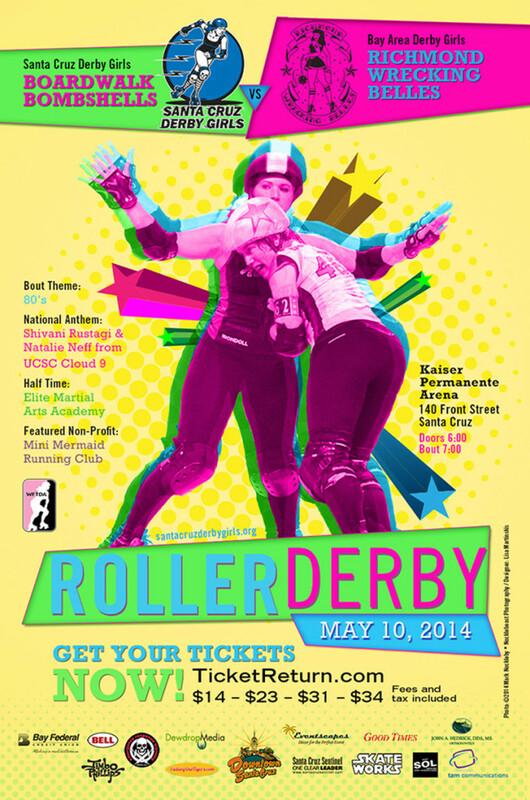 Berkeley Resistance bouts the Silicon Valley Roller Girls Dot.Kamikazes May 31 at 8pm at San Jose Skate. This bout is a double header so go early and watch the Silicon Valley Killabytes take on Faultline Derby Devilz from Hollister at 6pm. By the way, this will be your last chance to watch roller derby at San Jose Skate before it shuts down for ever. Tickets are $12 in advance, $18 at the door for general admission. Our Richmond Wrecking Belles battle the Santa Cruz Boardwalk Bombshells Saturday, May 10, at the Kaiser Permanente Arena in Santa Cruz. The Oakland Outlaws head to Los Angeles August 9 for the Rocket Queens Round Robin, hosted by the Angel City Derby Dolls. 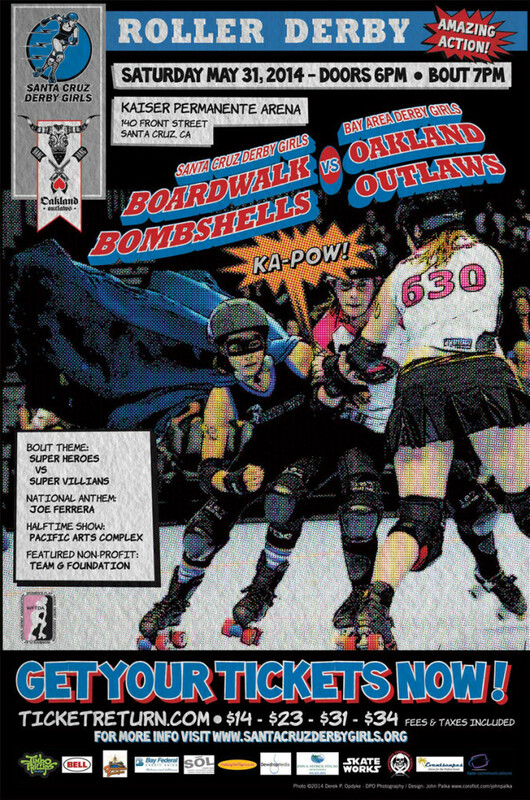 The Oakland Outlaws bout Santa Cruz Derby Girls Boardwalk Bombshells 7pm May 31 at Kaiser Permanente Arena in Santa Cruz. Get your tickets in advance before the best seats sell out. The hippies of the Berkeley Resistance travel to the central valley to take on the V Town Derby Dames March 22. This double header will also feature the V Town Darlings v Bakersfield Diamond Divas Roughcuts. For the second year in a row, the Belles will be at Battle for the Coast April 5-6 at the Ventura County Fairgrounds aiming to get first place in the tournament after coming in second last year. Competing teams are Richmond Wrecking Belles, Derby Revolution Bakersfield, LA Derby Dolls Ri-ettes, San Diego Derby Dolls Wildfires, San Fernando Valley Roller Derby, Santa Cruz Derby Girls, Silicon Valley Roller Girls, V Town Derby Dames, Ventura County Derby Darlins, and West Coast Derby Knockouts. The BAD All-Stars head to Culver City, CA, to participate in the Tinseltown Showdown April 13, hosted by Angel City Derby Girls. The BAD All-Stars will bout Terminal City All-Stars from Vancouver, BC.